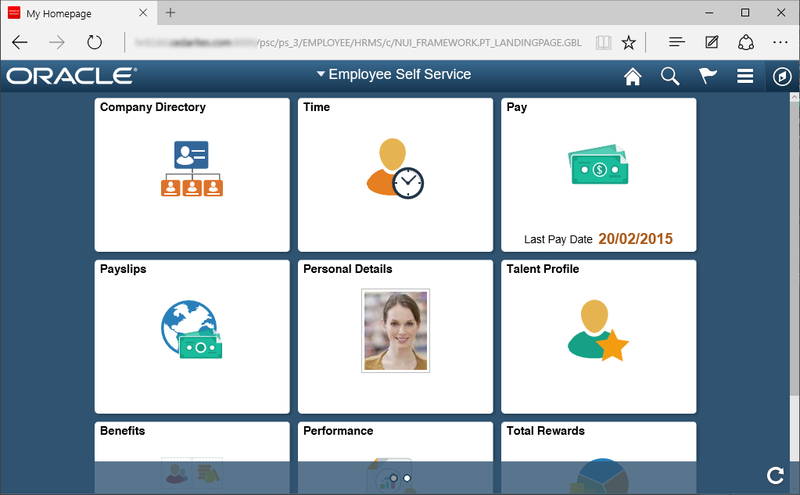 Posted by Duncan in Browsers, Look and Feel, PeopleSoft 9.2, PeopleTools 8.54, TW. The Windows 10 upgrade was released late last week, and with it came a new web browser – Microsoft Edge. Formerly codenamed Project Spartan, Edge is the default web browser in Windows 10. Internet Explorer 11 is also be included with the new OS, but is basically unchanged from the version of IE11 found in Windows 7 and 8.1. Although it might be a while until Windows 10 gains widespread enterprise adoption, it’ll likely have reasonably swift uptake in the home so Edge will start becoming an important browser for externally exposed PeopleSoft systems within 6 months or so. This is controlled by a ‘blacklist’ of sites however, so there’s no need to worry about your PeopleSoft implementation giving this message. So, does it work with PeopleSoft? The answer is Yes, it certainly seems to. I’ve spent a fair amount of time noodling through some ‘difficult’ pages and they look OK to me. I compared with HCM 92 Image 13 – the latest at time of writing – and both Fluid and Classic UIs look great. Posted by Duncan in PeopleSoft 9.2, TW. This is a guest post by Anton de Weger, a highly experienced PeopleSoft Consultant who works for StratusHR in Australia. Anton has been previously featured in the post “I’m Anton de Weger and This is How I Work“.